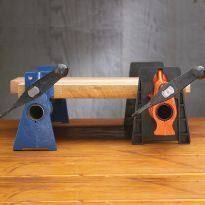 The wide base on our acclaimed Sure-Foot clamps prevents the old "domino effect" so common with ordinary bar clamps. Generous height allows free movement of the handles without having to overhang the edge of the bench. Pipes not included. New and improved design features 2-1/4" high jaws - a half-inch higher than standard pipe clamps! Ideal for use with our exclusive Bench Block® Pipe Clamp Stabilizers (#35359, sold separately) to provide a full 1" engagement with the workpiece on the lower clamp. 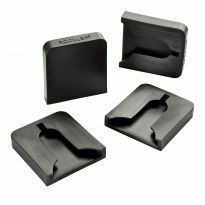 Add Sure-Foot Plus® Clamp Pads (#39897, sold separately) for added protection for your stock. It's nice to set your clamp on a table place your glue-up in and be able to turn the screw to tighten. The glue-up doesn't have a chance to shift. I love them, they stay straight and flat for gluing boards together. Better than any clamp I have ever used. Wish I had purchased more when they were on sale. Looks good, just waiting for a chance to use them. These are definitely made to last! Excellent product. Gives me more control while clamping. 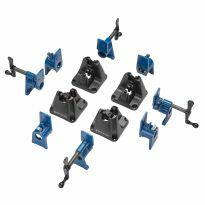 Rockler Sure Foot Plus Pipe Clamps. I love my Rockler Sure Foot Pipe Clamps! I use them every day and they make large glue ups so easy. No more clamps flipping over. I have over 10 pairs and highly recommend them! These are great. They certainly are sure-footed, and their height makes it easy to slide F-type clamps (and some other types of clamps) underneath to clamp the workpiece from below. These are great - I've got a set of around 10. Worked exactly as I needed. Nice height raises the piece clear of the workbench. Will certainly be buying more in the future. These are great clamps. They are easily turnable and adjustable. I bought these for future needs and am impressed to the max holding ability of them. 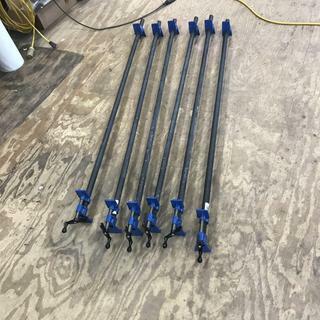 I bought 6 clamps and went to the local hardware store, bought 3 pieces of 10’ black 3/4” pipe to make 6-5’ clamps. To me these clamps are a must have if you do a lot of gluing and clamping. I like the fact you can tighten the clamps with out having to lift the work piece up from your work table. These pipe clamps stay where you put them and don't roll around like my old ones. This makes gluing up project much easier! This product is awesome the only issue is I need more of them. My favorite clamp for gluing up a table top or any large project. Rockler Sure-foot plus 3/4" pipe clamp. Good price, multiple/variable length, thicker clamping area and wider foot. Must get one more before sales end. Great and easy to set up clamps !!! The sure foot works well and the clamps are pretty solid. You really can't go wrong with them for the price especially. With a tool market seemingly overrun with cheap, all but disposable tools this seems to have a bit more lasting quality. I sprayed the pivots and threads down with dry moly lube before first use, and the clamps are very smooth. Have only used them a couple times but I feel like I got what I paid for. They have been working great with making my boards and I bought 4 more so I can make more stuff. Great clamps especially for the $. Well made and worked exactly as expected. Highly recommend getting the pads to go with these clamps. The clamps have good compressive strength and are quite stable. Great for building doors and table tops. The stabilizer blocks also work really well and are a fine complement to the pipe clamps. I consider these the best 3/4 pipe clamps available. The feet, the pre-drilled clamps for pad addition, and the easy handle make these unlike others. I have used these in the past with excellent results. Remember to balance the load - for every "botton" clamp" you will need a clamp on the top. The extended A-frame design is a big plus. Also the fact they can stand on there own lifting your project. I highly recommend. My first set of pipe clamps since I took shop class in school. They are perfect and love working with them. Perfect product and worked perfectly! Love the way it sits up off the bench! For very large panel glue ups. I bought several before and really like the large foot and lip to hang them. I already have some of these need more because they are great. Hold the work up clear of the table. Read review which said that the larger clamping area was better than other brands. Can never have too many clamps! Project in mind for shop. These will help to make my guitar bodies. I already own 4, I love them, and I wanted/needed more. They provide great clamping force with little effort due to the leverage given by the threaded handle and the stability of the feet are also great. Love this product! These clamps have a larger clamping surface area than other brand's clamps and they were on sale. They work well and are of good quality. 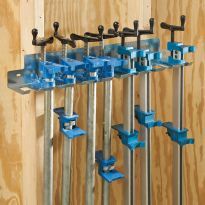 Always use more clamps and helped meet $35 for free shipping. A nice improvement on the design. I need something to hold wood together while it glues together. Picked up 4 a few weeks ago and wanted to buy some more before the sale ended. Excellent price and good clamping features. I have bought these clamps before and they are excellent. I'm hoping the reviews are right and they are a good clamp if so will probable order more. 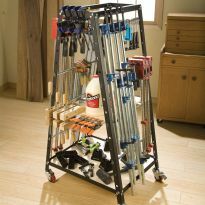 This item is the best thing I have found when it comes to glue ups. Are these clamps made by Irwin? 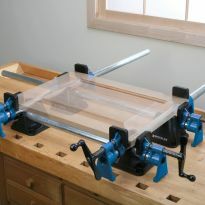 BEST ANSWER: The clamps are Rockler brand. I didn't find Irwin's name anywhere. They are great pipe clamps. Last I heard, these are Rockler's design. Rockler is stamped on the clamps. The pipe? Can I get like at Home Depot at any length as long as it's 3/4" and threaded on one end? I can't find the pipe for this tool anywhere... help please? BEST ANSWER: Yes, you can get any length 3/4" pipe. Yes you can, I have purchased several lengths of pipe at Home Depot to use with the clamp ends, I also have purchased the chrome versions from Rocker and they look the best. The Home depot versions of pipe can be various lengths and work very well. Yes you can get the pipe at Home Depot. They will cut it to the length you want and thread it for you. yes, that's why it's called a pipe clamp. Any three-quarter's pipe with a threaded end should suffice. Yes Home Depot actually stocks various links already threaded on one end. They have them at Home Depot. That is where I got mine. Does the end of the pipe need to be threaded? BEST ANSWER: Yes, the end of the pipe needs to be threaded, and the clamp fixture screws onto the pipe. You can buy different lengths of pre-threaded pipe at most hardware stores. The end that receives the half with the adjustment crank will need threads for mounting. Yes, one end of the pipe needs to be threaded. Just one end needs to be threaded. How long is one clamp? BEST ANSWER: If I understand the question, the answer is "how long is the pipe you bought" to put the clamps on. I keep different lengths for different clampings. the pipe is not included. You can buy 3/4" pipe at home depot at any length you want (they will cut it to size for you at the store). The clamp part sticks out about 2 3/8" from the pipe. The whole clamp assembly itself is about 9" end to end. As long as the piece of pipe that you supply is. It depends on how long your pipe is. 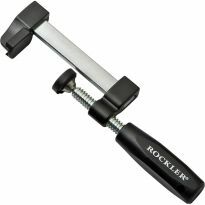 Does Rockler still offer the zinc plated 3/4in pipe? BEST ANSWER: I do not know there was no mention of any type of pipe other than3/4"
I dont know, I used alum for mine works good. BEST ANSWER: I think it is NPT. I was just able to get threaded pipe from the hardware store with no issues. This uses NPT. Same as black pipe at any home store. I usually buy the sections that have threaded ends on both ends and cut in half for two clamps, although most major stores will thread and cut the full length stuff also. It needs National Pipe Thread. NPT on at least one end. It is also included in the tube? Again, I'm not sure what you are asking. If you are asking if the rubber clamp pads are included, again the answer is no. Instead, I use sticky back cork, which they also sell in the store. Cut a little oversized and trim to fit. The Pipe Clamp Stabilizers are also a good addition. Not sure what you are asking here?!? If you are wondering if the pipe is included, the answer is no. You must purchase a 3/4 threaded pipe separately. The pipe does not come with the clamp. You can purchase a pipe length that best fits your project. You have to supply the pipe. 3/4" pipe threaded on at least one end. No the pipe is separate. What's the maximum clamping of this pipe clamps? BEST ANSWER: I'm not sure if you are speaking of length or force. The length is essentially unlimited - it simply depends on the length of the pipe that you buy to accompany the clamp (I bought mine - steel gas pipe - at Home Depot). If you mean force, it is probably several hundred pounds, at least. The clamp is essentially a vise. I get two of several sizes. Such as 24 inch, 48 inch and 72 inch. Don't forget that pipe with threads on both ends have the advantage of connecting a 72 in pipe with a 12 inch pipe using a pipe coupling. I have used two 72 inch pipes together to make 12 ft pulling boards together tight. Max length depends on pipe you use. The package only contains the ends of the clamps. You can go to any big box home store and have them cut down a large section of 3/4 inch pipe and thread the ends to whatever length you need. Can this pipe clamp be used with 3/4" galvanized pipe? BEST ANSWER: Sure can and does not leave black glue marks. I use both, black and galvanized. Are the clamps steel or cast iron? BEST ANSWER: They are cast iron. Thanks for the response. Are any clamps steel? I'm trying to make a fire pit cooking rack with the rack being able to adjust higher or lower. I.m going to pound a 5' x 3/4" pipe 30" into the ground with one end of a pipe clamp with some angle iron welded to that and a oven rack welded to the angle iron. BEST ANSWER: Yes you can, I have a variety of lengths. Where are these clamps manufactured? Are these the same as the ones I bought several years ago? Or have they made design changes? BEST ANSWER: I am not sure because I don't know what you bought several years ago. I have had mine for 2-4 years and they look like the ones in the picture. Thank you Tom, I knew that was not very well worded question. I should have added that my previous ones are also Rockler Sure-Foot clamps. 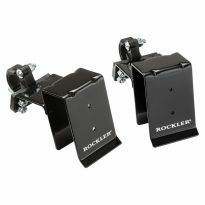 I don't recall how long ago, but they do look like the picture of these Rockler Sure-Foot Plus clamps. I'm curious if they have made the "clamping face" taller? As well as any other improvements. I'm sure that mine are older than 4 years. 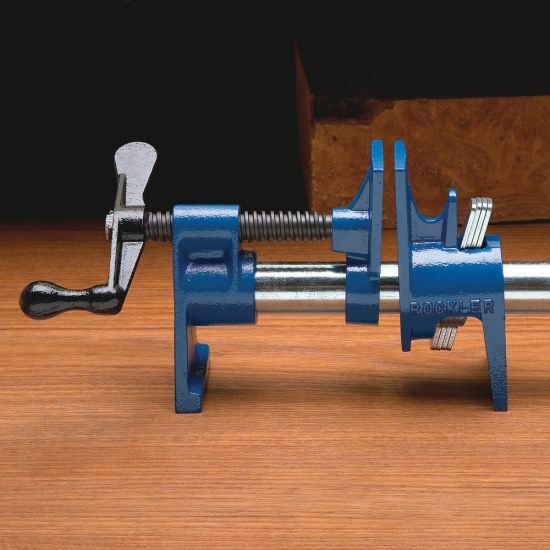 Probably when Rockler first came out with the Sure-Foot clamps. I had previously had the Pony clamps and hated that they always fell over. The Sure-Foot was a great improvement. Now I need more and would like to have them match what I have. How can I get replacement pipe clamp ends?